I was desperate for a pet – a dog. I hadn’t had one for a few years and missed it terribly. Finally I moved entirely so that I could get a dog and within 6 weeks began scouting out petfinder.com and later the humane society. I looked at one and went to visit, but knew she wasn’t right and left a donation so that I could keep looking (and feel less guilty). I knew that I wanted a dog that needed daily walks in the park, but I was leaning against border collies and heelers because I was renting and knew they could be crazy if their exercise needs weren’t met. Aggie – a smaller and redder version of a Shepherd – was not the dog I had viewed online when I actually went to the shelter; that dog was not there. Aggie was not happy to be in the loud, and chaotic kennels. After a little time, I was looking at her and a slightly younger shepherd mix. But she was a little less happy to be at the pound. It made me notice her more and increase my desire to get her out – despite her being a heeler mix. She was a stray and her kennel name was “Angel”, depicting her temper, but I took her outside and saw that she needed to RUN! I caved and brought her home. I amended daily walks to twice-daily walks to accommodate Aggie’s need to run. It took a week to get the cat to understand he wasn’t the only one any more. It took 6 months for them to become friends. But she’s been the perfect dog for over 4 years now. Obedient, reasonable, patient (as long as she gets her runs/walks in) and a wonderful companion. She’s the most important thing in my life – well, tied with the cat! 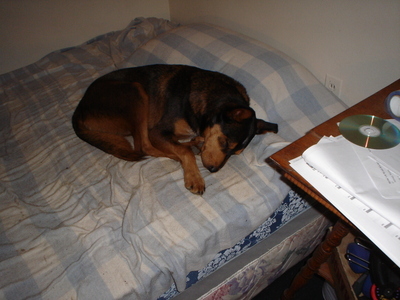 About the pic: prior to my recent move, Aggie had the spare old mattresses to herself. When we moved, I got rid of those mattresses and now she could really use a bed.